Mana Island Fiji is a large, long thin island surrounded by white sandy beaches and crystal blue water, allowing you to swim or snorkel straight off the beach. Over 300 acres in size, Mana Island further offers lush tropical rainforests and mountainsides, with hiking to the hilltop lookout point, offering panoramic views over the Fiji islands group. Mana Island is surrounded by a unique and spectacular fringing reef that is home to a huge variety of coral and tropical fish. The nearest open water reef is just 5 minutes by boat, making this a diving paradise with over 30 major dive sites and many uncharted reefs still waiting to be explored. You can view schools of tuna, spanish mackerel, barracuda, white tip and black tip reef sharks, turtles, manta rays and even eagle rays. Whether it's a secluded romantic getaway for two or a beach holiday with the whole family, Mana Island offers affordable accommodation to suit all needs. There are also a fantastic range of land and water activities to ensure fun for all ages - including scuba diving and snorkelling, banana boat rides, kayaking, sailing, parasailing, sail boarding, fishing, walking around the island to the local Fijian village or walking along one of Fiji's most beautiful beaches, Sunset Beach and enjoying a picture perfect sunset. 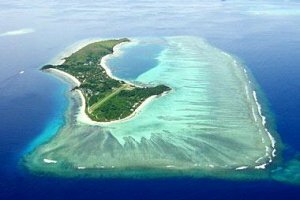 Mana Island is part of the stunning Fijian Mamanuca Islands and is located approximately 32kms west of Nadi International Airport. There are a number of different ways to get to Mana Island including a 12 minute flight from Nadi airport, 1 hour boat ride via Morning Breeze Transfers from Smugglers Cove or the more popular 1½ hour South Sea Cruise ship that leaves from Port Denarau and drops various passenges off at all of the Fijian islands in the area. Accommodation at the Mana Island Resort includes a sort of mystical charm that provides travellers who are seeking peace and quiet with a truly blissful reverie. This unrivaled Fijian island resort is surrounded by white sandy beaches and the pristine waters of the Mananuca Islands. The Mana Island Resort allows you to experience a range of great activities, real relaxation, lush tropical flora and delightful dining all in the same tropical island paradise. So come and discover all of the wonders and friendly atmosphere at the Mana Island Resort in Fiji. If you want hotel and/or resort accommodation on Mana Island at cheap rates for your next holiday then Holidays Fiji is the place for you. We give holiday travellers the ability to compare a range of hotels, resorts and apartments at the same time, thus making it easier for you to decide where it is that you want to stay. So book your accommodation at any of the Mana Island resorts with confidence, and even take advantage of the cheaper rates for longer stays.